October 5, 2012, marked the 50th anniversary of the first James Bond film, Dr. No. Bond, a fictional member of the British Secret Intelligence Service MI6, has been portrayed by six different actors in 22 films. In each movie, Bond uses his wit, charm, and a collection of high-tech gadgets to foil the villain and save the world, often with a beautiful woman by his side. If revenue is any indication of Bond’s reach, the estimated $5 billion earned by the films suggest that Great Britain’s most famous spy has become an influential cultural icon. Viewers have debated gender roles in the Bond movies since the beginning. Some saw the early Bond girls as representations of liberated women. For the most part, however, those characters were little more than a vehicle by which Bond could achieve his mission or demonstrate his masculinity. As the women’s liberation movement gained momentum, many argue that the Bond girl gradually began to reflect society’s shifting gender roles. Actress Carey Lowell, who played a Bond girl in the 1989 film License to Kill, points out that over time the characters have evolved from arm candy to equals. For example, both Michelle Yeoh’s Mai Lin in 1997’s Tomorrow Never Dies and Olga Kurylenko’s Camille in 2008’s Quantum of Solace are intelligent, skillful women with their own agendas who team up with Bond to complete their missions. Perhaps the biggest shift has occurred within Bond’s MI6. The most prominent recurring female MI6-related character in the early films was Miss Moneypenny, a secretary best known for flirting with Bond. With the 1995 casting of Dame Judi Dench as M, the head of MI6, a woman now supervised Bond. Thought to be based on Dame Stella Rimington, the real-life head of Great Britain’s Security Service MI5 in the 1990s, M reflected the changes occurring in society as women began to fill more positions of power. The 23rd James Bond film, Skyfall, debuts in November. It seems likely that the series will continue to adapt to changing social norms. After all, James Bond is nothing if not versatile. 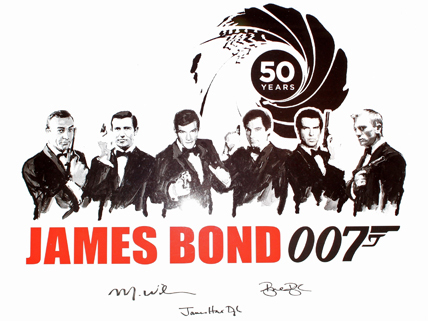 This article describes the history of the James Bond franchise. Professor Karen Tongson discusses how the portrayal of gender has changed in the Bond films. Follow this link to learn more about Stella Rimington, the female head of MI5 on whom Judi Dench’s M is rumored to be based. I was the first to read it!! I was the first to read this!!!! CHEESE!!!! !